No-one needs to tell you that the reader is the most important person in the world to a publication. Conventionally, the journalist is responsible for maintaining this focus. Sadly, a great deal of journalism these days, especially online, is 'churnalism' in which barely disguised press releases take the place of reader-centric writing. There is another way. It probably won't win me many friends among my journalistic peers (although it could save their financial bacon) and that is to ask vendors themselves to write reader-focused and informative, non-selling, articles about their specialist subjects. In my case, the readers being focused on are those responsible for technology in law firms. The trick is to have a good editor who will help the contributors to get it right - i.e. send it back with recommended changes, seek clarifications and corrections or simply give it a light polish. Having handled a couple of dozen pieces for LawTech magazine, I'm amazed how few had to go back for a rework. Let's come back to the journalists and their 'financial bacon'. The document properties of one or two of the pieces revealed that they were ghost-written by freelance writers. If vendor staff are too busy to do the writing and publications are too strapped to pay decent rates, this represents a good 'halfway house' for a writer. They're not involved in writing 'puff' pieces, the vendor gets a mention and a web address in the magazine and the reader gets some solid information which contributes further to their understanding. To add a little colour to what I've said above, here's my latest editorial from LawTech magazine. It also introduces Tom Foremski and his Every Company is a Media Company philosophy. What a terrific bunch of people we have writing for us this month.They are all experts in their various fields and, despite the majority working for vendor organisations, they’ve all made a real effort to talk to you and address your needs. It’s not easy for them; they must feel tempted to give their products and services a little mention in every paragraph. But they’ve resisted heroically. The result is a collection of articles, which we hope you find interesting and informative. Yes, each is written by someone who knows his or her company better than any other, but show me someone in a senior position that doesn’t have wider experience of the marketplace. Most bring a broader perspective, and it shows. You will find that some articles overlap others but these different points of view will all help to round out your own perspectives. We are not here to guide you in a particular direction but we hope that by laying out these different viewpoints, article by article, issue by issue, that you are better placed to make your own tough decisions about which strategies to pursue and what sort of vendors you’d like to work with. years ago by Tom Foremski, a former journalist who left the Financial Times after 30 years to found the Silicon Valley Watcher blog. He’s seen first hand how important it is for companies to share their knowledge, usually through their own online media. He has helped many companies achieve this by applying strong editorial standards to the process. And this is where we come in. We’re an independent publication with a strong editorial ethos that believes in giving the experts a chance to engage with a carefully selected audience. And that’s you. Thank you for reading LawTech magazine. We have some great issues planned for the future. The feature themes for the coming year are detailed on the website. The backdrop of ‘security’ and ‘cloud’ will always be there, but if there’s anything else you’d like us to cover, please drop me a line. Is authority the first word or the last? David Weinberger was one of the co-authors of the Cluetrain Manifesto which looked at the impact of the internet on markets and organisations. He wrote his first blog post in 1999 but didn't hit his stride until 2001. That's probably years before any of us had even heard of a blog, or social networking, which is where this particular blog post is heading. He's a genuine guy and a deep thinker and he's written some great books and delivered some brilliant lectures. "...in the old days, we took expertise and authority as the last word about a topic. Increasingly, the value of expertise and authority is as the first word - the word that frames and initiates the discussion." This is at the heart of the dilemma that traditional management faces when trying to figure out the role of social networking in the organisation. Assuming the value is understood, it becomes mainly a cultural issue. Some organisations - especially knowledge-based ones - are predisposed to sharing, openness and self-direction, while others are more into command and control. In the first instance, management might define the desired outcome and leave employees to decide how to get there; Weinberger's "first word". And in the second, the process will be rigidly defined. The management of each type of organisation adopts its style because it believes that is the most effective way to get things done. Although, it has to be said, persistence with a command and control approach could also be a function of fear (of the lunatics running the asylum) or laziness (because it's always been done this way). Some organisations realise that some departments are well suited to a more collaborative, networked, style while others are best run in a traditional way. Marketing versus computer assembly, for example. The problem such companies face is social networking creep. It's as if one lot of employees have freedom to work where they like and when they like providing they achieve their objectives and the other lot are chained to their desks or their workshops and have little discretion over their use of time and (in particular) online resources. The deskbound ones are the ones who will be eyeing the socially-networked crowd with some jealousy. One company solves the problem by allowing anyone to participate but it's thrown a firewall around all social activity - restricting it to dialogue between the company employees only, although it is about to invite some customers and business partners to participate. Another says, "do what you like, but achieve your work objectives." Another is trying to monitor all online activities in order to reprimand those who step out of line. Do you keep communication behind the firewall? This would restrict access to valuable information and external contacts. Do you let people do what they like as long as they achieve targets? This might work best if they pay their own communication costs. Or do you monitor every move? Employees may find this distasteful, if not illegal in some countries. In the end it comes down to trust. The social media evangelists will argue that it's only through openness, transparency and trust that organisations will move forward. Others will argue that this is nonsense and that some people simply cannot be trusted with these new tools. To paraphrase Dr Weinberger, this blog is only the first word. If you have experience-based views on the foregoing, we’d love to hear them. Is the eco-wind blowing your way? Now, with Copenhagen looming and the Carbon Reduction Commitment legislation just around the corner, large organisations especially are beginning to realise that a regulatory steamroller is heading their way and they will need to do something about it, quite regardless of their anthropogenic climate change beliefs, or otherwise. In terms of business operations (as opposed to political lobbying or scientific research), it's probably best that organisations focus on what they can do which will deliver genuine benefits while minimising their impact on the environment. Generally speaking, benefits boil down to cost savings and increased revenues, although public bodies are likely to focus more on the former than the latter. Some software companies - Access and Microsoft Dynamics spring to mind, although I'm sure there are others - got into carbon accounting before their clients were fully aware that this was going to become important. Hats off to them, and others like them, who knew what had to be done and just got on with it. They will, hopefully, reap the rewards of their early efforts. As ever, the pioneers aren't usually the ones that walk away with the big prizes. While journalists and bloggers have been complaining about the apparent lack of action, the big guys were getting on with the job. They were watching what's going on out there, putting their own houses in order while preparing new products and services for market. Now they're emerging from the woodwork. For example, CA managed to secure the name ecoSoftware for its SaaS-based measurement and reporting system aimed at medium to large businesses. It looks into every nook and cranny of a business in order to assess and report on its environmental health. It takes the whole sustainability perspective, rather than concentrating on carbon or energy alone, for example. It takes its feeds from just about anywhere - hand entered meter readings, electronic feeds and inputs from other recording systems. It integrates with other software, especially the major ERP systems. Users can drill in and out of detail, and filter the information in a variety of ways - by business process, by GHG Protocol Scopes, per shipping unit, by floor area, and so on. The end result is action plans based on genuine insights and, of course, the ability to measure progress. Another company, 1E, is probably best known for its NightWatchman system which minimises the power use of the desktop computing estate. It has recently announced a system for measuring data centre energy use and identifying how much useful work each server is doing. It can change the power profile of each device according to the work it is (or is not) doing. The system reports what's been going on in charts and tables and users can drill into any unusual patterns. It will integrate natively with hardware vendors' own tools or scripts can be created for exceptions or new developments. Crudely stated, the point of the exercise is to maximise the business value delivered with the least use of equipment and energy. These examples serve to show which way the wind is blowing. Organisations will find that the IT industry will be key to helping them get a grip on their environmental obligations and costs. It is a case of a win all round but, as is frequently the case, no one will win bigger than the IT industry itself. A couple of weeks ago, Wiley asked if I'd like a review copy of Dan Bricklin's 'Bricklin on Technology' book. Normally, I'd say "not on your Nelly" because I know what a chore book reviewing can be. However, I was at the West Coast Computer Faire in March 1980 when Bricklin collected his first award for VisiCalc - the pioneering spreadsheet for the PC. I was also a fairly avid user of his 'Demo' program a few years later. Even though I don't think we met, (unless it was in Zaragoza a couple of years ago), I felt connected, not least because I also developed and published PC software for many years, but without his degree of visibility or success. When the book arrived, I winced because it's more or less 500 pages long. Unless you're a commuter or you don't get much sleep, how do you find time to read that much? Anyway, the book was enjoyable at a couple of levels and a disappointment at another. Enjoyable because it peeled off and examined the layers of thinking that went into various products and issues. Bricklin leaves no stone unturned in his pursuit of insight. The transcript of an 85-minute interview with wiki inventor Ward Cunningham is a classic in this respect. (It was 37 pages.) I'd rather Bricklin had identified and pulled out the key elements but then, I suspect, this would have been an editorial step too far for him. He would have had to impose his own interpretations on the conversation, rather than laying it out in full in front of his audience. You will get insight if you read this book. Insight into what brought us to where we are and a few glimmers into how we might get to where we're going. The other enjoyable bit for me, which you won't all share, is that I've met (albeit fleetingly) many of the people mentioned in the book, worked with many of the products and written about many of the issues. Bricklin and I even started programming at the same time - early 1966, and we've both tried to take the user perspective in our work. The book triggered many long-dormant memories and reawakened many old feelings, especially in the late 70's/early 80's as we all groped our way through the chaos of the emerging microcomputer/PC business. This is not really a reason for buying the book because Bricklin's chosen subjects seem, in the main, to be serendipitous. A comprehensive history book it is not, although it is a useful addition to the history of the IT world of the late 20th century. The book is a compilation of old blog posts, essays and transcripts of recordings, loosely arranged around topics which Bricklin finds important, all topped and tailed with narrative from the perspective of 2007/8. As he says in the conclusion, "On any topic you can explore deeply and find nuance", which more or less sets the tone for the book. He does dig deep, he records faithfully and, at times you want him to make his point more quickly. But maybe that's not what he's trying to do. Perhaps he's trying to help the reader understand the nuances, so that they can move forward with their own thinking. I don't know. Most of his topics have some resonance today, although much of the writing has been overtaken by events or absorbed into the mainstream. The chapters will give you a clue: What Will People Pay For? ; The Recording Industry and Copying; Leveraging the Crowd; Cooperation; Blogging and Podcasting; What Tools We Should Be Developing? ; Tablet and Gestural Computing; The long term; Historical Information about the PC; Interview with the Inventor of the Wiki; and VisiCalc. It's a ramble round the industry and round the inside of Bricklin's head. His invention of VisiCalc gave him a passport to go where he likes when he likes and meet who he likes. And that's what he's done and, in this book, shared it with us. My approach, if you're thinking of buying it, would be to say "I'm getting a good 300-page book, I'll just need to pick which 300 of the 500 pages are of most relevance to me." It's a bit like his approach to software - give the user the tools and let them choose how best to use them. Call me an idiot if you like, but I fell for one of the oldest tricks in the book this morning. A few weeks ago, a colleague forwarded what looked like an interesting invitation from Infor to watch some webinars. My response was to wonder to my colleague why Infor hadn't written to me directly since it knew me. But all this was forgotten as I finally got round to doing something about it. CFO Europe and Infor recently sponsored two webinars addressing green issues: "Green Strategy and the CFO: At the Crossroads between Profitability and Sustainability" and "Environmental Performance Management: How CFOs Contribute to the Green Strategy". I'd taken a briefing from one of the speakers in January and thought this was a chance to catch up. All was going swimmingly until I noticed a spelling mistake on one of the slides, the very mistake I'd pointed out in the January meeting. Then it dawned on me, the 'recent' webinar was no such thing. It was recorded last November. A key learning is that organisations which treat their green, or sustainability, strategy as somehow separate to their business strategy are probably setting themselves up to fail on both counts. The two need to be integrated for the best overall results. In fact, we're really talking about integrating corporate social responsibility (CSR) which should incorporate green strategies. The CFO was chosen as the focus because they are the custodians of corporate information. They own the budget, they have influence in all departments, and so on. They are well placed to provide or withhold funding according to the likely impact on the balance sheet of any investments, green or otherwise. When the audience (at the original webinar) was asked what practical impact green awareness had on their organisations, most identified 'process improvement' as the major impact. This suggests that existing processes were improved rather than 'rip and replace' major investments made. Very few - around three percent - identified 'cost cutting' as a benefit, a fact that astonished the speakers. They couldn't see how reducing energy use could fail to cut costs. One of the speakers suggested that the 'either/or' polling mechanism might have been the cause of the surprise. When it comes to implementing an environmental strategy, the key is to link it to organisational objectives - financial returns or benefit to stakeholders, for example. Gross margin could link to energy use or market share to customer perception. Failure is usually either the result of lack of funding or lack of communication. If the funding is tied to specific actions which result in future success then it will be, itself, sustainable. Effective communication to employees and stakeholders needs no expansion here. The audience was asked to vote on barriers to success. Way out ahead of all others (at 63 percent) was 'other competing priorities', which simply reinforces the need for linking investments to organisational goals. One of the speakers warned about starting too many key initiatives. Twenty to thirty would be plenty. Definitely not hundreds - this is the sort of thing that results from attempting to implement every 'good idea', rather than filtering out all but the most impactful. Legislation is coming, it's still a bit muddly, but this will change the business case because, although voluntary in the early stages, it will eventually impact the bottom line, for better or for worse. This is expected to bite within four years. The one thing that always bothers me about these presentations is that the supply chain is largely ignored when it comes to the question of equipment replacement. One of the speakers mentioned first year write downs of certain conforming equipment purchases: a fine incentive to invest in green equipment. But no-one ever seems to address the embedded environmental footprint of the new equipment and that of disposal of the old. It seems to me that, by using the business as the boundary of environmental calculations, totally wrong decisions can be made in the context of the planet as a whole. What it actually did was frighten the audience witless and provide it with some virtual hatches to batten down. Frightener-in-chief was Tony Juniper, environmental activist, ex-director of Friends of the Earth and the Green Party's candidate for Cambridge. As you might imagine, from someone who's been beating the environmental drum for many years and who had a major hand in creating the Climate Change Act, we have no time to lose. Among other things, he pointed out that the temperature-rise effects of our behaviour take 30 years to show up in the atmosphere, which means we're already deeply in the clag. Later in the session, Michael McCarthy, the Independent's environmental editor, reckoned our actions to date have already committed us to a 1.4 degree rise. Juniper pointed out that the most recent records show that the past three years have been even worse than the worst predictions. The next speaker, Charles Leadbeater, is author of We-think and was introduced as "Tony Blair's favourite thinker". Not something designed to go down well with an audience whose politics were unknown. Despite this, he struck an encouraging note, suggesting that technology (including the web) could be mobilised to tackle some of the issues raised by Juniper: dematerialisation in the form of eliminating travel and using screens to collaborate/meet; and, sharing knowledge about solutions online so that the physical work can be done locally using indigenous materials. He likes the way that the web can make lateral connections in new ways. He does, however, see that the creative solutions that will be invented to sort ourselves out will cause significant change and turmoil. He believes that we need to look both backward to pre-industrial times, at our old ways of organising and commmunicating, as well as forwards to a different kind of future. The other speakers - Chris Tuppen, BT's Chief Sustainability Officer, and Hamish McRae, the Independent's Chief Economic Commentator, tried to focus on the positive but the backdrop of gloom was fairly palpable. They talked of efficiencies and savings that were possible but, overall, the sense was that bad things were happening and good things, in the sense of proper political leadership, weren't. Everyone saw the upcoming Climate Change Conference in Copenhagen in December as a crucially important meeting. The hope is that the participants will lay the foundation for a low carbon recovery from our present financial woes. But this requires political will of a high order. Reading between the lines, it would seem that many senior politicians still haven't realised that their previous, perhaps lifelong, concerns have been trumped by this new reality. When our own government cut VAT, it sent out a signal to 'buy more' which wasn't a remotely environmentally friendly message. This futile gesture did nothing for sales but it cost the government billions in lost revenue. Imagine if that money had been targeted at home insulation, or something else that would have cut energy use and, for the beneficiaries, their electricity bills. Hope flickered intermittently, as speakers talked about intelligent grids, cutting consumption rather than increasing generation, electric cars and carbon capture. But, without the drive from the top, as in that shown by a Churchill or a Kennedy (and a corresponding willingness by businesses and the public to be led), then we would appear to be facing a very uncertain future. Technology will undoubtedly play its part but what's really needed is a dramatist to write a new script. And quickly. In the process of digging around the 'greening' of data centres (no, don't laugh), I ran into the boss of Migration Solutions, one Alex Rabbetts. By a weird coincidence, his Surrey office is more or less exactly on the spot where my computer department was in the early seventies, when I first started taking 'sustainability' seriously. In those days, I was inspired by E F Schumacher's "Small is Beautiful" book. I was further motivated by the country's oil supply shortages, not to mention the fact that my company made stuff from hydrocarbons. And then, to put the tin hat on it, Ted Heath forced us into a three-day working week. It made me dream of a better world in which we consumed less and thought more about our environmental impact. I embarked on a journey which, due to a number of side-tracks, took 29 years to bring me to a meaningful destination, environment-wise: involvement in a huge sustainability project, primarily with the Science Museum. During the past fifteen months, I've been applying this experience to the IT world through my work with analyst firm, Freeform Dynamics. We knew from the start that IT was both a contributor to environmental damage and an enabler of savings elsewhere. We also knew from our research that companies are not turned on by doing green things for their own sake. They are primarily interested in money, appearances and regulation. Alex Rabbetts not only came to the same conclusions himself, but he added an environmental assessment service to his data centre building, consultancy and operations company. If you have a data centre of less than ten thousand square feet, his firm will conduct a fixed price assessment for £2,500, an amount he would "normally" expect a client to recover in three or four weeks. The assessment looks at 120 different factors which have an environmental impact. He knows that no data centre can be green, but most of them can be greener. Unlike hardware vendors, whose natural instinct is to get you to replace kit, Migration Solutions is independent of vested interests (apart from its own) and can usually find plenty of improvements without touching the hardware. The company looks at the whole environment, including things like noise, light and waste, as well as power. It triages its findings into things which can be done for nothing, things which require a bit of expenditure and things which can wait until the next refurb'. He takes into account regulations, both current and upcoming and warns that companies with over, say, 50 racks* could be pushed into the arms of the government's upcoming Carbon Reduction Commitment legislation. Initially, this will apply to any company on half-hour metering that uses more than 6,000MWh of electricity per annum. DEFRA's website currently claims that companies spending more than £1M on electricity could find themselves subject to this regulation. Both Rabetts and I remember the figure being £500,000 just a few weeks ago. And a quick Google of '500,000 crc site:www.defra.gov.uk' brings up bunch of pages with the old number on it. It very much looks as if the government has taken the pétard of fluctuating energy prices and hoisted itself with it. Either that or it realised that, at £500,000, its catchment would overwhelm the regulatory system. But, whether you're liable or not, it might be worth taking a look at Migration Solutions' service. It is pragmatically focused on environmental principles with the by-products of potentially saving money, looking good and being prepared for regulations when they head your way. I said 50 because your organisation is bound to have non-IT energy bills too. A breath of fresh air. Eventually. Many companies have spoken to me of their ambitions to become carbon neutral by some date - usually long into the future. Others talk of cutting or offsetting their C02 emissions in a shorter timescale. While admirable in their intent, closer examination reveals that they are working to different criteria. They may choose a different base year. They may restrict their emissions by product or division. They may choose to ignore 'embedded' environmental damage caused by the mining, manufacture and delivery of the components they use. They might conveniently forget the in-use related emissions or ignore the end-of-life consequences. What I want to concentrate on here is where the edge of policy lies. When the Carbon Reduction Commitment regulations arrive in 2010, the top 5,000 or so companies will be obliged to account for their direct and indirect emissions (from supplied energy). So all the accounting applies to what happens within the organisation. A company could theoretically dodge penalties by offshoring or selling off the nasty bits of its operations. But, given that the aim is to improve the earth's climate, this won't make a blind bit of difference. Indeed, if manufacture is 'offshored' then additional carbon (etc) costs will be incurred through transportation. Once again, I feel I should make it clear that reducing humanity's impact on the environment is a good thing, quite regardless of whether or not we are actually the cause of climate change. There's no point in challenging the carbon orthodoxy, but there's nothing wrong with pointing out the narrowness of its vision and the timidity of its targets. Think of camels and committees. Fundamentally, I'm suggesting that we accept the regulations but we don't treat them as gospel. If all we do is conform to the obligations set down, then the world is likely to become a much worse place in environmental terms. The difficulty lies in knowing quite what to do for the best. Recently, someone at Vodafone was talking about teenagers and young adults changing their mobile phone handsets up to three times a year. They don't think about embedded carbon. Fashion is far more important. At the same meeting, someone made the astonishing assertion that Formula One motor racing is 'carbon neutral'. A mobile phone shop might claim a clean environmental record based on its operations, quite ignoring how the stuff they sell came into being. Or, indeed, where it goes to at the end of its life. Max Moseley has been getting a lot of press lately, but not much with respect to his reforestation initiative in Mexico, something he kicked off in 1995, in close cooperation with Edinburgh University. The FIA Foundation's news archive from 2002 states that it, "offsets all the carbon dioxide emissions from racing cars in the Formula 1 and World Rally Championship series." In an excellent guide for businesses called 'Getting to Zero', written by Clean Air - Cool Planet and the Forum for the Future, the authors state: "it seems unlikely that carbon-intensive activities such as Formula 1 motor racing can ever credibly claim neutrality." Interesting that it slipped the word 'credibly' in there. And, to be fair, the FIA does not trumpet its neutrality, even if (judging from press coverage) it once used to. This is probably because offsetting is perceived by many as a kind of cheating. For organisations which are serious about genuinely improving the environment, offsetting is seen as a measure of last resort. But, there again, if a business like Formula One has to continue, offsetting is infinitely better than doing nothing at all. Sticking with Formula One, it would be nice to think that all the teams' private transport between events is included. But what about all the people who drive to these events? Not to mention the masses of non-team suppliers and support services. I have no idea what's included in the offset calculations. And this seems to be a general problem, not just for Formula One. Where does accountability end? Where should it end? The 'Getting to Zero' report offers some good answers and plenty of food for thought. It refers to the three types of greenhouse gas emission: Scope 1 is the onsite stuff - direct emissions from company-owned or controlled sources; Scope 2 is indirect emissions, caused by the generation of electricity consumed (actually, it can include other energy sources); Scope 3 includes other indirect emissions resulting from the company's activities. This stretches upstream to the production, processing and transport of raw materials. It extends corporate emissions to include business travel, employee commuting and outsourced corporate support services. And it includes downstream emissions in distribution, retail, product use and product disposal. Currently, most concerned companies set their responsibility boundary around the Scope 1 and Scope 2 emissions, with the addition of business travel from Scope 3. To strive for genuine neutrality, organisations would need to take all of Scope 3 into account. And, in the public eye, this is what they will be measured by rather than by their ability to meet regulatory obligations. If, as so many companies claim, they really want to address climate change, this is the only honest way to do it. No-one's making out it's easy, but the 'zero' guide is a good place to start. We've just released a research report called ‘Green Computing: The role of IT in the push towards environmental sustainability’. While doing the research and validating the findings it rapidly became clear to me that few people are constantly aware of the big picture and their part in it. IT is, after all, just an enabling component in an organisation's strategy yet, to listen to some people, 'greening the data centre' is the start and end of its environmental contribution. The report examines the broader role of IT and actually gets inside organisations and looks at the drivers for green (and 'green', incidentally, isn't high on the list), cultural issues - including attitudes to IT, where responsibilities for action lie, and how IT can support the organisation's sustainability objectives. The statistical content was based on feedback from 1474 IT professionals while the interpretation was a combination of experience and consultations following the report's first draft. Anyway, the point of today's post is to introduce you to FrEDI, an illustration which reflects all the areas that need to be considered when participating in an environmental sustainability strategy. The acronym stands for Freeform Environmental Discussion Image although, in retrospect, perhaps 'Illustration' would be a better last word. Its purpose is to keep people's minds open to the bigger picture when discussing and planning their environmental activities. As you can see, there's a certain amount of blurring between the various elements of the illustration, this reflects the fact that nothing happens in isolation except, possibly, the determination of the drivers which are best decided at board level, even if some of them are informed by others within the organisation. You will also notice that the drivers are two-tone - one for internal drivers, such as budget or PR value, the other for external drivers, such as government regulation. The only way for the drivers to be implemented is through people and they are reached and inspired through leadership. Which, of course, comes from people. Hence the blurring. You may notice that both drivers and leadership fade out at the bottom, leaving the field clear for people, processes and ICT to intermingle and bring about the necessary change. People are on top of the stack, quite deliberately because nothing at all happens without people. 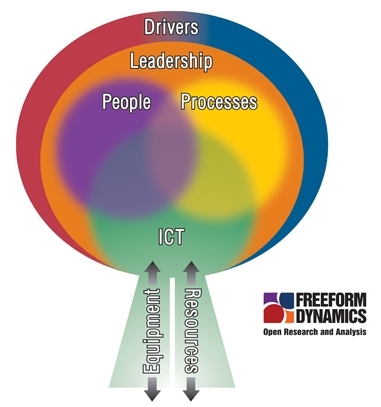 Processes are created and carried out by people and most of them are intimately supported by ICT. The bottom part of the illustration hints at sustainability in that equipment and resources have to be chosen, acquired, used then disposed of. They are split in two, to reflect the different nature of hardware and resources. Servers, storage, cooling, PCs, laptops, thin clients, mobile devices, printers, etc on the one hand and electricity, paper, ink, toner, water etc on the other. We believe that it is useful to have an illustration like this to hand whenever debating environmental matters so that the bigger picture is never lost. Organisational and individual benefits will be maximised through harmony and environmental benefits will drop out as a by-product. Do take a look at the report if this subject interests you. And, of course, your feedback is always welcome. PS In case you were wondering, the fact it looks like a tree wasn't lost on us. In fact, it looks most like an Evergreen Oak, but we realised that if we called a tree, then this would lead to hierarchical expectations when, in fact, we're all in this together. Green IT: We're getting there. Slowly. One of the great things about working for Freeform Dynamics is that we get to find out what's actually going on inside organisations. How? Well, we are able to survey the readers of The Register; one of the most successful online IT publications in the world. Recently we've conducted a couple of surveys and participated in a four-hour online debate, all around the subject of Green Computing. The surveys attracted about 2,400 responses and the conference hundreds of delegates. These people were all, naturally, interested in the subject and, by and large, involved in IT in some way. But the view that they gave us was enormously interesting and we were able to slice and dice the numbers by geography, type of company, company size and their attitudes to environmental issues. You can listen to the presentations now so, rather than go over old ground, I thought I'd flick through the stack of unasked questions and deal with a few here. Even though we allowed over two hours for questions and answers, quite a few fell by the wayside. People were demanding a reduction of the environmental footprint of equipment manufacture. If, as one speaker claimed, 75 percent of a PC's environmental footprint is accounted for before it is switched on, then it's clear that the manufacturer has the greatest potential to reduce the environmental impact of its machines. This would have to include the supply chain - if components are made in China, for example, does this mean the energy is derived from coal-fired power stations? It needs to cover the packaging and transport of the elements and of the finished goods. It needs to take account of the consumption of raw materials, the pollution of the land, the air and the water. And it needs to take account of end-of-life recyclability. This is all way too complicated for buyers to assess. They need ratings such as the EU Energy Labels on white goods which rank products from A to G.
The environmental impact figures are more or less inverted for servers. According to some, their working life accounts for 75 percent of the overall impact. I would imagine that this refers to energy alone, but it still suggests that attention to usage could pay significant dividends, especially as electricity prices continue to rocket. Hanging over all the decisions is the big one: cost justification. Many people asked how they can convince their finance departments to cough up for greener but more expensive products. In due course, environmentally-focused regulations and taxes will start to put pressure on various bits of the supply chain and on a company's own environmental performance. It would be nice to think that some carrots might be mixed with the regulatory sticks but I won't be holding my breath. Some companies, of course, are already seeing a PR value in going green and others, such as Sun Microsystems, IBM and Cisco have found ways of slashing their travel, accommodation and office expenses by adopting various forms of teleconferencing and teleworking. This rather neatly fits a green agenda too. So, in certain types of organisation, simple cost justifications can be made already. None of this is easy. Prioritising actions is difficult. Some people were worrying about the difference between leaving a computer powered up to read stuff on screen and printing it and powering the machine down. (My vote would be to keep the machine running, but I fully expect to hear a counter-argument.) The data centre consolidation and virtualisation story is a good one from all perspectives. Smarter cooling, too, can be cost justified. But once you've done these things, then what? This is where measures and guidance are sorely needed. I have spent masses of time rummaging around to try and find some decent measures. I've asked experts in the field and we're all agreed: we're not there yet. Bits of guidance exist - Energy Star, the EPEAT programme and the Greenpeace Barometer, for example. But nothing that makes it easy for people to make sensible decisions. However, in the UK at least, several organisations - the British Computer Society, the cross-government CTO Council, the Market Transformation Programme and others, are working on various parts of the measurement jigsaw. Some results are expected this year. Organisations like the Carbon Trust and the Environment Agency are trying to keep a handle on what's going on so that efforts are complementary and not wasted. Data centres will figure largely early on but the CTO Council will make public a list of topics, prioritised by practicality and the amount of benefit which will accrue. Scorecards, benchmarks, strategy templates and procurement guidelines are all part of the mix. It's astonishing that we've known about upcoming environmental problems for decades now, but we're only just beginning to take things seriously. This is why the help and guidance we need is still not readily available. We're just going to have to use common sense for now and make environmentally friendly choices whenever possible.